Some tour revisions, and news of Jakob Dylan's coming album. More tour dates confirmed, including Germany. I moved the Dylan/cash gif-movie to the BobVideo page. I also hope to put in counters for some pages starting April 1st. It gives me great pleasure to announce that the highly respected Dylan magazine "The Telegraph" is on line from my site! You are welcome to step in and have a look. I am testing a programme that lets me set up a chat and discussion forum on the Web server. I have no idea whether this will be useful or not. I cleaned up some errors here and there. Thanks to Andreas G, you are now able to get to the Eulogy for EDLIS Agent Ben Ryan, and the links on the Dylan on the Internet page to Grains of Sand and DylanWEB, Bob Dylan: His Life and Work, 1964-1966 are correct. Today the wife, I and one kid, Greg, went to a motorcycle show in Mosjøen. She bought saddle bags for her new bike, and we ate at Frank's. I cleaned up the format of Guitar tunings, added material in the Atlas for Highway 61 and Red Wing, linked up Paul Williams' December 95 review to other December dates and discovered that part of Thad Williamson's reviews were obscured by HTML mistakes. So, go to the 1995 list and select Dec 17th. Well, HWY61-L is now giving us news that Bob will play soon, and some flames have turned into apologies, and many realize how important the list was to them. Me, I have made preparations for collecting 1996 concert setlists and reviews. They now say Bob will play Portland, Maine in April, and tickets go on sale this week. I put Durango into the Atlas. More on the Never-Ending Band and people who played with Bob in concert. Look at the top of the Who's Who list! And then there is the great thread on guitar tunings started by Andrew Mullins! HWY61-L II - the Dylan mailing list is back again!! Now let's all behave and get back on topic. The Cynthia Gooding interview is where you can hear (well, in this case, read) Bob spinning his myths about his past. - Yes, the 5 minute radio interview went OK, they played "Blowing In the Wind" as intro and outro. I told them I don't write much myself, but thanks to people on the Net, there's a lot to find out about Bob and his music. People from more than 60 countries have visited "Expecting Rain", although about 25 countries make up the frequent visitor list. Tomorrow morning at 0720 CET I will be interviewed by phone on local radio (Nordlandssendinga P1). What shall I tell them about Bob, the Internet and Expecting Rain? I'll think of something. 1 - HWY61-L has stopped. HWY61-L was the mailing list mirror for the usenet newsgroup rec.music.dylan. Many of us are now sadly missing this forum. I want to thank Maureen for all her efforts to keep the list working all this time! A replacement list owner is urgently required, please contact Ben Taylor if you can help. It may be necessary to find a new home site for the mailing list if HWY61-L has ended permanently..
2 - A little more on Jakob and Jesse Dylan in the Who's Who. I placed links to Bill Parr's Slow Train Coming site on the Dylan On the Internet page and the EDLIS Agents page. The Video page now includes a link to a QuickTime player for UNIX on Sun. Soon I will test out the gif-movie format, which will play a small movie as a gif in many browser windows. Check back soon! 1 - Our local newspaper, Rana Blad, printed an interview with me on March 16th. I tried using table formatting on this. Please tell me if it gives your browser trouble! 2 - here are new UNofficial CD titles and T-numbers. 3 - The Atlas entry on Redwing has been added to. 1 - I updated my page about this server, and added some boasts on the Reviews page about how this site has been mentioned in newspaper articles, both here in Norway and in the US! 1 - Ray has posted the freshest tour rumours! 2 - Greg Lake is slipping into the Who's Who. 2 - and sorted out the Dylan on the Internet page. 3 - I included ann Alta Vista search link AND a form to search the HWY61-L Archives, all at the bottom of the Dylan on the Internet page. image from it on the Web. 2 - If you are looking for Dylan content, I have a link to Anders Gustavsson's new GRaiNS oF SaND Dylan Web site on my page Dylan On The Internet. 1 - So much on The Freewheelin' Bob Dylan Outtakes, I have split it in those three parts, at: UNofficial CDs - T-304 on the T-list. 2 - More chart information. 3 - Blind Willie McTell has gained a foothold in the Who's Who. Meant to justify the link to an interpretation of the song of the same name. 1 - I don't think I have mentioned that several people have done some good research into Dylan's chart performance. 1- The Freewheelin' Bob Dylan Outtakes is an UNofficial CD. LOTs of information on this one (and many others) at: UNofficial CDs - T-304 on the T-list. 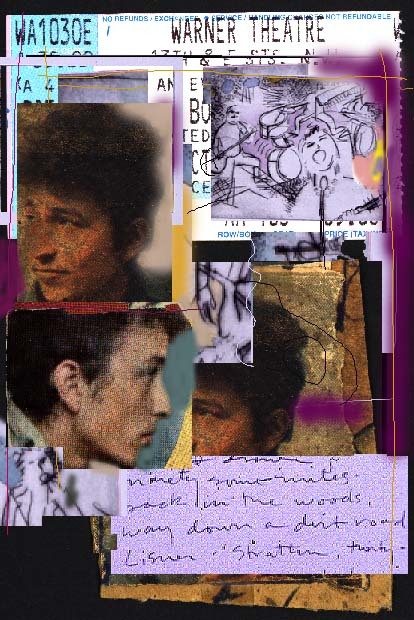 1 - Sigrid Trumpy has made a Dylan collage, using Photoshop. 2 - A great story from the Fort Collins Hard Rain concert in 1976. 3 - The Atlas would never be complete without the Royal Albert Hall. Now it's there, and we're one step closer. 4 - The Who's Who now will tell you about Finley, of Finley's farm. Remember the song? 1 - New UNofficial CDs. 2 - More on Hurricane in the Who's Who. 3 - More on Fennario in the Atlas. 5 - UNofficial CDs: DEEP Beneath The Waves, vols 23, 24, 25. 7 - Bob called La Repubblica in 1993. 1 - I have the pleasure of inviting you to the official opening of the Web cartoon "Dylans Downloaded", story by Sandra H. Ramer, drawings by Marguerita! 3 - More chart information. 1 - Small revisions of the front page, a new Deep Beneath the Waves (Vol 22), which means updates of about 10 files! 2 - Also a listing of the b o o t leg covers shown on the Highway 61 CD-ROM. 1 - More on Joni Mitchell, including links, in the Who's Who. 2 - Added Dylan links to the Dylan On Internet list. 1 - Eleven new UNofficial CDs with Townsend numbers listed (but not reviewed, sorry) in the T-list. 2 - I moved a concert review from 951110 to 951011. You can see where I got confused, can't you? Anyway, this one did not like what he saw and heard, so if you need a different perspective, read it! 1 - Nico deserves an entry in the Who's Who. 1 - The Who's Who has some more on Lord Buckley, Doc Pomus and Winston Watson. 2 - There are no tour news, just rumours. Thanks to Jeff, I have found a concert date from last year that had slipped from the 1995 list. It's May 27 at Laguna Seca Daze, the file was there all along, but with no link to it. And a new EDLIS agent has been appointed, the Food and Drink agent! I'm back from Luxembourg, where the fog lay so thick, I had to board a bus from Brussels to get there. I went there to attend the Jukebox project meeting, which you are welcome to read about! 1 - MOJO review of the Dec 11 concert has been added to the setlists. Look under that date! 3 - Doc Pomus has entered the Who's Who. 2 - The Who's Who has additions on Angelina, Jacques Levy and Joey. 3 - The setlists has an added N.Y. Times review of the Dec 11 concert. It can be found under that date. I'll be away around the middle of next week, to Oslo and Luxembourg. 1 - In the Dylan Atlas, there is talk about Argentina, Montague Street and Delacroix. 2 - In the Who's Who, Angelina has entered the scene. 1- Moe has made up his mind! The best UNofficial Dylan CDs of 1995. 1 - Have you heard of Clobal Chat? I suggest you read about it, get it, and then we'll talk on IRC channel #dylan all day!. I have made a Web page on which users with Global Chat installed can just click on a link to launch the chat programme. Get Ready! 1 - I have more information on UNofficial CDs. 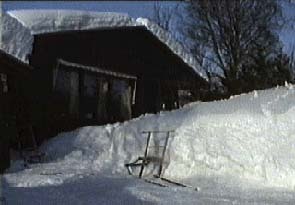 Kaj K. Borum has supplied label information for several CDs. 1 - Moe has heard "GUITARS KISSING & THE CONTEMPORARY FIX" 2CD (no label) complete acoustic show (Bob Dylan) and electric show (Dylan & The Hawks) from Manchester, UK Free Trade Hall 17 May 1966. 1 - Christine Consolvo found a review from May 1976. 2 - Dupree has been added to the Who's Who. 3 - A first step in video, offering QuickTime snips, among them the verses missing in the US showing of "Restless Farewell" at the Sinatra bash. 4 - I have revised the list of unofficial CDs, with links to the images I have and to Moe's reviews. 5 - Also, a concert review from 1986.